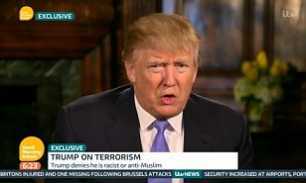 Donald Trump condemned Muslims today for failing to report suspicious activity within their own communities - insisting they must do more to help prevent attacks such as those in Belgium. The US Republican presidential candidate said it was 'a disgrace' that a suspect behind last year's Paris attackshad been found after a long manhunt by police in an area of Brussels where he lived. Mr Trump, who wants a ban on Muslims entering the US, condemned the 'outrageous' attacks on the Brussels airport and metro yesterday and said he would 'hit ISIS so hard you wouldn't believe it'. But a London police chief hit back at Mr Trump's remarks this morning, saying he was 'wrong' to blame Muslims for failing to report extremists.